The above lines were uttered by Ven. Hikkaduwe Sumangala Thera, during the era when Sri Lanka was under the British Colonialism. Since the introduction of Buddhism in 246 BC and its establishment, Sri Lanka had been a Buddhist country. Unfortunately, the invasion of the British and its impact on Buddhism and the innocent Buddhists, had drastic effects on the people. They were converted into Christian religion. The apostate sovereign could no longer protect the Sasana. Thereupon, the holy places of Buddhist worship that should have been in the possession of Buddhists were controlled by the followers of another religion. Both Buddhist bhikkhus and lay people became helpless. How painful! How could the Sri Lankan patriots endure the gravity of such a tragedy caused by the foreign rulers? Sri Lanka fell into the hands of the British on March 2, 1815, which had been protected by the ancestors even at the cost of their lives. The Sinhala Flag which fluttered proudly in the sky was replaced by the British Flag. At the end of the 19th century, the Sinhala Buddhists had to suffer various inexplicable plights. Such an unreasonable influence caused the Sinhalese a great deal of torment and oppression. All their social, religious and educational responsibilities were grabbed and suppressed by the British. On one hand, her economy was exploited and her fields, gardens and houses were devastated and burnt. On the other hand, her art and architecture, her poetry and literature, her music and song received massive blow. At such a critical moment, a child was born on January 20, 1827 to a couple, Abeyweera Gunawardhana and Dandagoda Gamage, in a beautiful village named Hettigoda in the Southern Province of Sri Lanka. The child was Don Nikulas. The Sinhalese who were deprived of their culture, traditions, customs, religion and their homes, had to go through Baptism. This little Nikulas had to be baptized in a church after his birth. With the passage of time, there came an auspicious time to introduce him to books as it was an important landmark in his life. It was a custom and was usual to go to a learned Buddhist monk to get a child’s first reading done. Though there were lay teachers, his parents took the child to Ven. Sobhita Nayaka Thera, the erudite monk, for his first reading, which was done in May 1832. Having obtained permission from his parents, he entered the dispensation of the Buddha in 1840 and adopted a new name Sumangala, Ven. Hikkaduwa Sumangala Thera. From his childhood onwards, he was skilful and had a deep respect for Buddhism. Having gone to Parama Dhamma Cetiya Temple, he obtained invaluable advices from Ven. Valane Sri Siddhartha Nayaka Thera, the Viharadhipathi. He learned Sinhala and Pali with the assistance of Ven. Thotagamuwe Pannamgoda Jethuththara Thera and Ven. 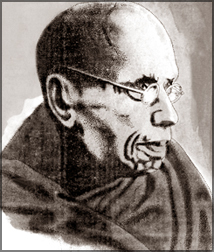 Bowila Sri Dhammananda Thera. Furthermore, he acquired a good knowledge of English from Mr. John Coraneris Abeywardhana and a good knowledge of the Sanskrit language from Brahmin Kashinatha Vidyalankara. Likewise, he received advice in connection with monkhood from Ven. Batuwantudawe Devarakshita Thera. Ven. Hikkaduwe Sumangala Thera was the embodiment of various praiseworthy qualities. He was obedient, faithful and grateful to his teachers. He grew up gradually along with the thought of restoring Buddhism to its rightful place. In 1847, he obtained his Higher Ordination, ‘Upasampada’ at Pushparama Uposathagara in Kandy. During the Uposatha ceremony, he had presented some Sanskrit slokas composed by himself. But the presiding bhikkhus were doubtful. They did not accept that such a small Samanera could compose Sanskrit slokas in that manner. It was a challenging matter to him. In order to dispel their doubts, he in their presence made some Sanskrit slokas within a short time. It was indeed an astonishing incident that they had ever experienced. The tremendous negative impact of the English education on Sinhala culture and civilization was unjustifiable. At that time, there was not a single press where he could print and publish at least a magazine. The magazine he wanted to publish was especially written with regard to regain Sri Lanka’s identity as a nation and to restore her lost prestige. It cannot be said that there were no presses. There were but they were controlled by the British rulers. But, he did not shrink back. He was dauntless in his courage. He imbued himself with a great self-determination and dared to establish a press called Lankopakara in Galle in 1862. It was there where he printed a significant and influential magazine named “Sudarshana”. Ven. Bulathgama Siri Dhammalankara Sumana Tissa including other bhikkhus and lay people ventured to contribute their support for the publication of this important issue. It brought forth a lot of inspiration and enthusiasm in him. As a result, there appeared in 1863 “Buddha Vag Saraya”, in 1873 Magazine of Doctrinal Studies appeared. It was published with the profound hope to challenge the irresponsible propaganda work, foreign missionaries and thereby, to reassure the dynamic and inherent strength of Sri Lankan ancient culture and civilization. It is notable that during his struggle for the long life of Buddhism, he did not forget to render literary service. He would have published countless books in various languages if he had not had to devote his time to revise and amend Tipitaka and Sinhala arts and literature to serve society. There was literary significance not only in his books published but also in his articles published in several languages such as Sinhala, Pali, Sanskrit and English. There is no doubt to say that his numerous issues were published in order to challenge the British power. This great deal of issue was compiled together and considered as one as “Brahmadharma or Anusasana Sangrahaya”. In 1887 appeared a Sinhala grammar book called Warnaritiya. In 1847, there appeared Sinhala translation of Mahavamsa, which could win the hearts of many and it was considered as one of his best literary publications. “Sidathsangraha Sannaya, Simawibhagaya, Kavsekara Sannaya, Sandhi Sangrahaya” were some of his publications which reflected his multi-skilled qualities. Amidst all his publications, the commentary of Balawatara or Balawatara Tika is the most appropriate and explicit witness for the reflection of his immense scholastic knowledge. Apart from these, when he was residing in Galle, he published Ladbhitulawa, Atmaparikshawa, monthly publication-Sudarshana, in 1862 Lankaloka, Samaya Sangarawa with his tremendous effort and energy. Under the approval of Robert Robinson, the post of leadership in “Sri Pada or Adams Peak” was conferred to him in 1864. It was the time when the foreign rulers were imposing various techniques, wiles and artifices to squeeze the Buddhists and were deprived of religious liberty. Despite the risk to his life, his services, rendered for the sake of the nation, religion, art, architecture and literature were unforgettable and remarkable. The great hope spreading the light of education was aroused in the hearts of Buddhists. He too had a great desire to inculcate the Buddhist education in the Buddhist society. But, the one and only problem he had was that there was no a place where he could do so. So, he popped on to Colombo and worked to sort out a congenial and accessible place at all. Being subjected to love, reverence and gratitude of the devout Buddhists, he could set up an educational centre, Vidyodaya Pirivena by name, at a holy place at Maligakanda Road in June 1873. Moreover, he held a council in the Pelmadulle Sri Sudharshana Dhamma Hall to protect and fortify the Sasana. On May 17, 1880, there arrived in this colony, an American Theosophist Col. H. S. Olcott. He was at once attracted by Ven. Sumangala Nayaka Thera and joined in his movement. With great courage, Olcott started to work with Ven. Sumangala Nayaka Thera for the revival of Buddhism, Buddhist culture and education. Furthermore, he was appointed as the chief of Siam Nikaya. Simultaneously, he became Viharadhipathi of the Paramadhamma Cetiya Pirivena. Later, he went to Paramananda Temple in Kotahena on the request of the citizens of the place. Thereupon, he founded Vidyadhara Sabha at Maligakanda. Still, this Sabha is doing a lot to the Buddhist Society. At this critical moments, Ven. H. Sumangala Nayaka Thera and Ven. Migettuwatte Gunananda Thera, both erudite theologians, challenged the Christian missionaries to an open debate on the merits of their respective religions. The debating skills of both overwhelmed their opponents. As death is inevitable and common to all, Ven. H. Sumangala Nayaka Thera, after his several years of social, educational and religious work in Colonial Ceylon passed away on April 20, 1911. It was an irrevocable loss to the Buddhist world. Ven. Hikkaduwe Sri Sumangala nayaka Thera, the eminent scholar, with a wide knowledge of Buddhism and the Buddhist philosophy, contributed a lot for the welfare of humanity. His noble services not only influenced the literature, art and architecture of people wherever he went but also helped them to be more compassionate and tolerant. He helped in redeeming the privileges of this nation and the Buddhist religion if not in the Government service at least in the estimation of society. In this regard, every year, we commemorate the anniversary of the passing away of the late most Ven. Hikkaduwe Sri Sumangala Nayaka Thera on April 29 at the Vidyodaya Pirivena to show our due respect and gratitude to him. This year, the 98th anniversary of the Nayaka Thera is going to be commemorated at the Vidyodaya Pirivena under the patronage of the principal of the Vidyodaya Pirivena, the most Ven. Balangoda Sobhita Nayaka Thera. May he attain the Supreme Bliss of Nibbana. The writer is a Teacher, Vidyodaya Pirivena, Teacher, Alexandra College, Principal, F. R. Senanayake Dhamma School, Vidyodaya Pirivena, Colombo 10. When India was partitioned in 1947 (West and East Pakistan) a few Buddhists lived in the sub continent. There was a Buddhist minority of about 100,000 in the district of Chittagong and Chittagong Hill Tracts, the southern part of the East Bengal, which had now become East Pakistan and later the independent state of Bangladesh. These Bengali Buddhists were Theravadins and they had successfully carried out reforms of their Sangha after 1856. In 1887 they had formed the Chittagong Buddhist Association, which was the earliest Buddhist society of a modern type to be founded in the sub continent. Some Tibetans (Buddhists) lived in Ladakh, Sikhism and other areas near the Tibetan border. Anagarika Dharmapala of Sri Lanka funded the Maha Bodhi Society at Colombo in 1891 and had its headquarters shifted to Calcutta (Kolkata) in 1893, in order to facilitate his movement to have the Buddha Gaya Mahavihara, wrested from the Hindu Mahant to Buddhist control. Another Buddhist association was founded by Bengali Ven Kripsaran of Chittagong Hill Tracts in Kolkata in 1892 named Bauddha Dharmankur Sabha (The Bengal Buddhist Association) to revive Buddhism in India, with branches at Saranath, Lucknow, Rajgir, Shillong and Darjeeling. The Maha Bodhi Society founded by Anagarika Dharmapala had branches at Buddha Gaya, Saranath, New Delhi, Lucknow, Mumbai, Nowgarh and Bhubaneswara etc. In 1956, Ven Acharya Buddharakkhita founded the Maha Bodhi Society of Bangalore, and this society established a monastic training institute at Bangalore, hospital and other social service activities. This society also founded a Maha Bodhi High School, Maha Bodhi Karuna Hospital, Mahabodhi Nunnery and an international meditation centre at Leh in Ladakh. These pioneering efforts to revive Buddhism in India was given a great fillip by Dr Bhimrao Ramji Ambedkar (1891-1956) who was born in Ambavade in Maharashtra as the fourteenth child of a family belonging to Mahar caste. The Mahars are one of the lowest social groups, considered untouchables and traditionally restricted to cleaning and maintaining streets, cremation grounds, beside the rivers and similar occupations Ambedkar’s family, the father a teacher in a military school joined the Hindu reformist movement of Kabor Panth. By a coincidence of fortunate circumstances, young Ambedkar was able to receive a high school and college education and on a scholarship offered by the Maharaja Sayajiras Gaekward of Baroda, he proceeded to New York and received his PhD from the Columbia University. On arriving in England he obtained a DSc from London School of Economics, for his seminal contributions to the subjects of public finance and monetary economics respectively. In England he studied law and qualified as a lawyer. Being a Bar-at-law having returned to India he undertook legal practice in the High Court of Bombay. He also served as a Professor of Political Economy and as Principal of a Law College in Mumbai. He was himself a visionary, educationist and established the People’s Education Society and opened avenues of higher education to hundreds of students of socio-economically disadvantaged sections of the society. He was a fearless journalist and published several periodicals mainly targeting socio-political layers vitally connected to the lives of the depressed classes. In 1936 Ambedkar founded the Indian Labour Party. As early as 1930 many of the Buddhists considered Ambedkar as the spokesman, as their political as well as the spiritual leader. His views were opposed to those of Mahatma Gandhi. Gandhi considered the caste system of Hindu India born institution which ought to be reformed to get rid of abuses like untouchability, but should not be abolished totally. For him the integration of the Harijana (man of god) was possible without the abolishing of the caste system, which was only a division of labour and be given a fifth status in the caste hierarchy of India. In 1935 at the Yeola Conference in Nashik District of Maharashtra he eventually declared very laconically that though he was born a Hindu he will not die a Hindu but a Buddhist. With his vision of eradicating untouchability in India he happily joined the Constituent Assembly to draft the Constitution of independent India, was made the Chairman of the Drafting Committee in view of his unparalleled skills in Constitutional Law. In the Constitution he provided chapters on the rights and privileges of members of the Scheduled Castes and Tribes, which provisions are still in force, wherein certain percentages are provided for so called low castes in the fields of higher university education and in the government jobs. The most outstanding event of the 1956 Buddha Jayanthi Celebrations took place at Nagpur on October 14, 1956. On that day Dr Babasaheb Ambedkar, embraced Buddhism, along with half a million followers at an impressive and historic ceremony at Nagpur and gave a clarion call to his people to take refuge in the Buddha - Dhamma. Addressing the gathering on this occasion, Dr. Ambedkar said in an emotional voice: “I started the movement of renouncing the Hindu religion in 1935 and since then I have been continuing the struggle. This conversion (Diksa) has given me enormous satisfaction and pleasure unimaginable. I feel as if I have been liberated from hell”. The mass conversion (diksa) ceremony at Nagpur was by all means a miracle, or a rebirth of Buddhism in India. Never before in the history of any religion in the world had so many people, on their own, at one time and at the instance of one man, had changed their religion into which they were born and bred. It was an epoch-making event that instantly changed the course of the history of Buddhism in India. With this historic inversion ceremony, Buddhist revival movement of India entered into an era of intense activity which can rightly be called the ‘Ambedkar Era of Indian Buddhists, after King Asoka of India of the third century BC’ Unfortunately, Dr Ambedkar passed away just 52 days after the Great Conversion Ceremony at Nagpur on October 14, 1956. This was indeed a terrible loss and his followers the so called ‘untouchables’ were orphaned but they faced the tragedy with great courage and fortitude. They not only marched forward but they also thought fit and proper raising a suitable memorial at the sacred site of the mass conversion. On a request by the Dr Babasaheb Ambedkar Smarak Samiti, Nagpur, to the Government of Maharashtra graciously to donate a 14 acre block of land where the Deeksha ceremony was held. The land was formally handed over to the Smarak Samiti by Yashwantrao B Chavan, the Chief Minister of Maharashtra State on 30 May 1961. The grand Memorial Stupa, which had been under construction for more than 30 years has since been completed. It is the greatest Buddhist architectural heritage of Nagpur. Unlike the historic Stupas of Sanchi (Madya Pradesh) the Deeksha Bhoomi Stupa is stupa shaped auditorium for mass gatherings. Its basement has living solace for Bhikkhus and small meeting rooms too. At the centre of the structure at basement level, a small Stupa marking the place where Dr Ambedkar stood to embrace Buddhism. This the biggest Buddhist auditorium in India, with the first floor of the Memorial Stupa with a big hall to accommodate more than five thousand people at a time. The facial appearance of the Deeksha Bhoomi Stupa is like that of Sanchi Stupa with a diameter of 120 feet and the dome rises upto 120 feet. The Deeksha Bhoomi has also a Buddha Vihara, Bhikkhu Niwasa and a flourishing Bodhi Tree brought from Ananda Bodhi, Sravasthi, all established by Bhadant Anand Kausalyayan, A Punjabi Buddhist monk, who resided at Deeksha Bhoomi from 1969-1982, and was the live wire to make the shrine, a living Buddhist entity in Maharashtra. Despite the demise of Dr Ambedkar and his followers left with no guide, the conversions to Buddhism among the Dalits (low caste people) continued unabated in Maharashtra and elsewhere in India. The Census Report of the Indian Government of 1961, had the most revealing wonder, the by-product of the activities of Dr Ambedkar. The Buddhist population shows an unprecedented increase from 180,800 in 1951 rising to 3,250,000 in 1961. Thus in the wake of even the death of Dr Ambedkar, The movement he set forth amid caste hierarchy of India leap-frogged to become a living religion in India, particularly in Maharashtra State. The Buddhist population after 1961, has been growing slowly and steadily. As per the Indian Census of 2001, of the 1.5 billion total population of India 83.6 are Hindus and the rest shared by Sikhs, Christians, Muslims, Jains and others and the Buddhist population was one percent as at March 1, 2001 accounting to eight million. Presently the Buddhist population in India is one percent of the title population namely ten million. The growth rate of Buddhist population has decreased from 36 percent, growth rate wise, in 1981 - 1991 to 23.2 percent growth rate during 1991 - 2001. This indicates the revival movement of Dr Ambedkar has slowed down progressively. The main reason is the majority of the so called Ambedkarites are not willing to take refuge in the Buddha? 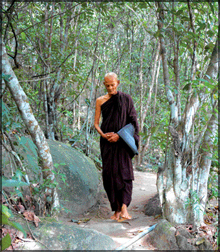 Another factor is proselytisation by Christian groups moving among the poorest of poor, helping them with finances and job opportunities, too plays a vital role for this disinterested in Buddhism to become Buddhists, as their personal needs, are provided for by charismatic groups of Christians. However, in some states the Buddhist population has increased substantially. For example, in Karnataka, the Buddhist population has increased from 73,012 in 1991 to 393,300 in 2001. Another drawback for the growth of Buddhism is the non-availability of Buddhist monks hailing from different racial groups with their own language. In fact India has around 1,700 languages, of which twenty are principal languages. Presently, Maharashtra, has the largest Buddhist population of nearly six million with Viharas of their own. Almost every city and village has its own Vihara. The largest number of Viharas are in Nagpur, the capital of the Neo-Buddhist Movement. Delhi the Capital of India has the second largest concentration of Buddhist Viharas, more than forty as against two prior to 1956.